Our latest and greatest dish bake brings together chicken and cheese for a taste everyone is sure to love. Prepare stuffing as directed on package; set aside. 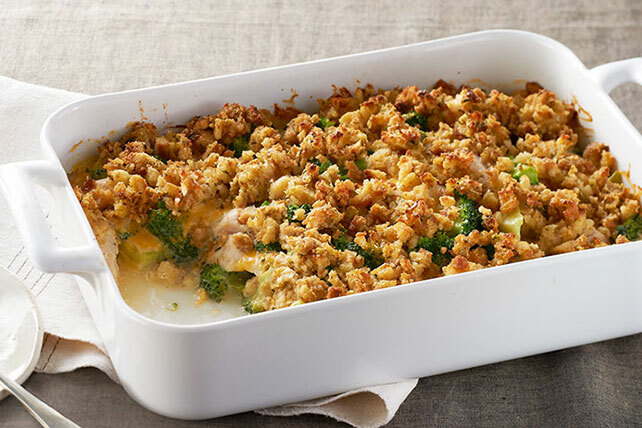 Combine chicken and broccoli in 13x9-inch baking dish. Stir in soup, milk and cheese; cover with stuffing. Bake 30 min. or until chicken is done and casserole is heated through. Prepare using fresh broccoli florets. Cool, then refrigerate any leftovers. Reheat, covered, in the oven or microwave before serving. The cheesy sauce will help keep the casserole moist.